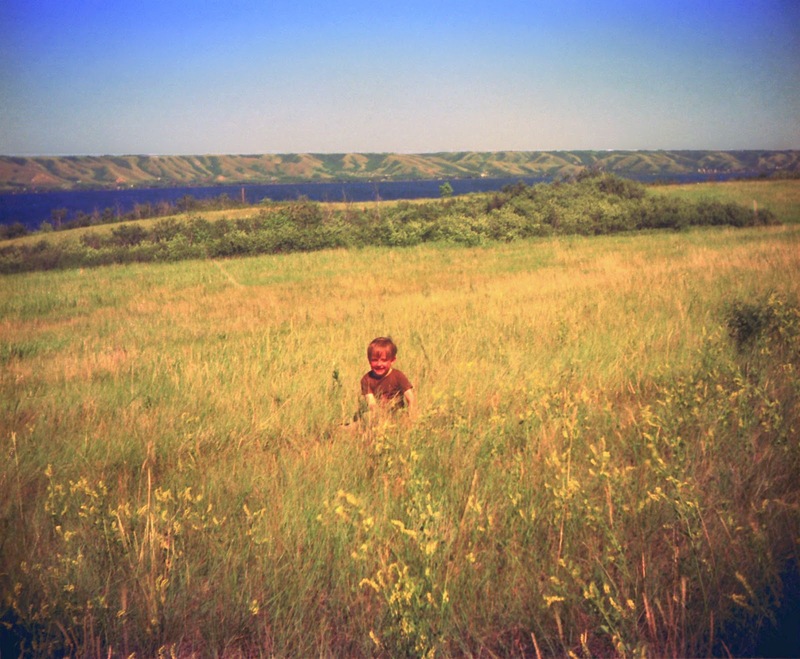 Here are Dad, Mom and Sean arranged in a triangle on a hill near Salt Lake, Manitoba. They didn't pose for this, I just happened to shoot at an opportune moment. It would be better if Sean were standing and if the unidentified folks in the background weren't present, but I still find the composition interesting. 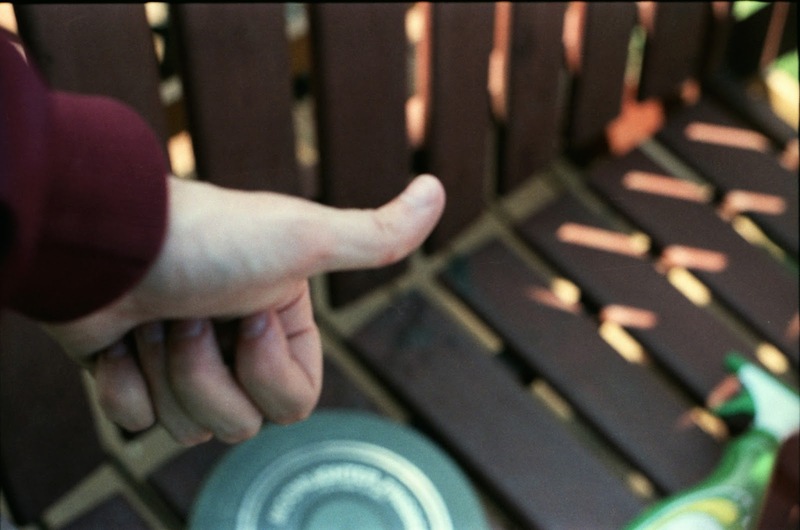 This shot also makes me feel like I should buy some more black and white film for the old T70. I'll have to ask Mom and Dad where this photo was shot, but it certainly looks like a nice place. I'm not sure if my face is badly sunburned or if the slide was merely discoloured and my corrections failed. Here's an artifact from my last successful election campaign. In Grade 10 (or did the elections happen in Grade 11?) I ran for Public Relations Officer of Leduc Composite High School's Student Council. My chief duty was to read the morning announcements during my Grade 11 year. I thought it was fun. I ran for President the following year, but lost by about 15 votes, if memory serves. What the people giveth, the people taketh away. If it were shot on black and white film instead of colour videotape, I'd almost claim that this screen capture from Generous Nature could serve as a legitimate example of film noir, thanks to its claustrophobic composition. I totally meant to do that! 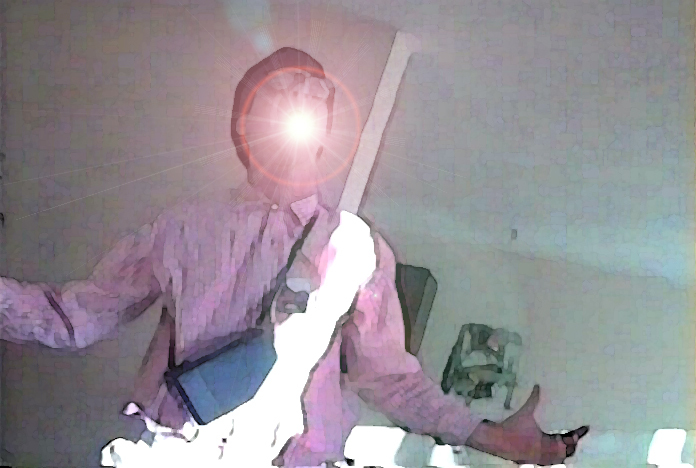 My friend Jeff hates a couple of things with a passion: the Paranoid Productions film Bitter Litter, in which he stars, and Photoshop's lens flare filter. For my own amusement, and because I know this will make Jeff cry "Argh! ", I combined Jeff's two antipassions in this image. On the way home after seeing Batman v Superman: Dawn of Justice, Sean and I attempted to record our thoughts on the film. Unfortunately, the recording cut out after 30 seconds, so I present here a more traditional review, with Sean's thoughts thrown in as I recall them. We went into the film with very low expectations, so our agreed-upon score of five out of ten stars may in fact be too kind, since we expected the movie to be even more dire than it was. In short, we felt there was a good movie in here trying to get out, but Zack Snyder's leaden, depressing, joyless direction overcame whatever promise the film once held. The film begins with a reasonably interesting premise: Batman sees Superman as a threat because of the events in Man of Steel, during which Superman's fight with General Zod and the other surviving Kryptonians laid waste to Metropolis - as well as Gotham City, which we discover in this film lies across the bay. Public opinion on Superman is torn thanks to the circumstances of his arrival, and if you buy the premise and tone of Man of Steel, Batman v Superman's themes work in that context. This presumes you accept that this film is very much Zack Snyder's dark vision, and the characters onscreen, save perhaps Wonder Woman, behave in ways that are so far out of character fans will wish Snyder would leave DC Comics alone and make sequels to 300 or Sucker Punch instead. Sean pointed out the film's dismal portrayal of poor Perry White, who's been a crusader for truth in journalism for 75 years in the comics, reduced here to a cynical shell. Diane Lane's Martha Kent tells her foster son, Superman, "You don't owe this world a thing," the complete opposite of the Kent values as espoused, again, during decades of comic book stories. It gets worse. Batman is angry at Superman for all the collateral damage he caused in Man of Steel, but Sean rightly points out that Batman kills a number of people in this film, and overtly uses pistols and machine guns in a dream sequence in such a way that it's clear he's comfortable using them in real life, too. Batman brands suspects in this movie. He is prepared to kill Superman. Superman, for his part, behaves like an arrogant bully during at least two points in the film, and mopes around for the rest of it. Only during the film's final act is he at all heroic - more on that later. Sean made note of Jesse Eisenberg's ludicrous, over-the-top portrayal of Lex Luthor, taking care not to blame the actor, but the screenplay and director. To that I would add Luthor has no motivation for his actions in the film. He does things because he's the villain, because he's Lex Luthor and of course Luthor hates Superman (and Batman). In the film itself, the audience is given no reason to explain why Luthor is so hell-bent on wiping out Superman (and Batman). Why couldn't the fight in Man of Steel destroyed a project dear to Lex's heart, or perhaps killed his sister? Any motivation would have been better than what Snyder provided: Lex does bad things because he is evil. Kudos to Jeremy Irons; his Alfred Pennyworth is perhaps the only character who's actually in character this whole movie. I suppose Amy Adams' Lois Lane comes in a close second; Adams is always delightful, but like the other characters she's working against a very weak screenplay. The film is disrupted by a number of dream sequences. Clearly Snyder is desperate to be seen as a serious filmmaker, as these sequences are leaden with pretension, but he succeeds only in confusing the audience or making it roll its collective eyes. Cameos by the Flash, Cyborg and Aquaman are so clumsily handled it's embarrassing. I'm not a professional screenwriter, but I'm smart enough to see at least two different ways those cameos could have been included organically, building the DC cinematic universe without making viewers think they're watching an ad for later films in the series. Sean and I both agree that Ben Affleck and Gal Gadot do a good job as Batman and Wonder Woman, respectively. Affleck has enough gravitas and anger to carry the role, and Gadot is a revelation; in just a few minutes of screentime, she displays more charisma, sympathy and bad-assery than anyone else in the movie. Personally I thought Henry Cavill did a good job as Superman given what he had to work with, but as Sean noted, "How many lines did he even have?" He's right; the Man of Steel is more plot device than character in this film. We both agreed that the film does pick up somewhat in the final act, as long as you're willing to forget all that came before. The moral conflict that sparked the film is dropped in the most ham-handed way possible and never resolved, because of course the heroes have to team up to fight a giant monster. For what it's worth, the final battle itself is well choreographed, exciting, and finally gives Superman a chance to be heroic, though very near the end of the film's overlong running time. Aside from all of the above concerns, this is a joyless, almost literally colourless film. Characters are treated like chess pieces to move the plot forward, the aesthetic is depressingly nihilistic, and Zack Snyder clearly doesn't understand the fundamental properties that have sustained these characters over the course of three-quarters of a century. In other words, when Batman fights Superman, everybody loses. Especially the audience. Yesterday I stumbled across The Needle Vinyl Tavern while looking for a place to have lunch on Jasper Avenue. Normally I shy away from pub food, but the location was convenient, so I wandered inside. I was immediately impressed by the menu's clever design, which, as you can see, emulates an LP. The album inside the sleeve serves as the drinks menu. The back of the sleeve hosts the food menu. I had the Soft Pretzels & Provolone Fondue as an appetizer; it was excellent. The pretzels were warm, soft and lightly salted, while the dip was creamy and flavourful. For my main course I sampled the Grilled Chicken Club. While the fries were run of the mill, the sandwich itself was superb, with crispy lettuce, fresh tomato, a grilled sourdough bun, scrumptious bacon and most importantly, a very moist and tasty chicken breast. My only quibble with The Needle is the seating; most tables are accompanied by those really high chairs, which I find uncomfortable and annoying. Luckily I found a bench seat. In anticipation of Batman v. Superman: Dawn of Justice, I compiled a list of the prior Superman family movies, ranked according to my preference, with some brief thoughts on each film. Here's the list, over on my Letterboxd account. In the mid-90s Milestone Comics and DC Comics published an intercompany crossover story about the Milestone characters and DC's Superman family. One issue came packaged with a set of vinyl stickers you could apply to the front and back of the comic; it was a do-it-yourself cover. 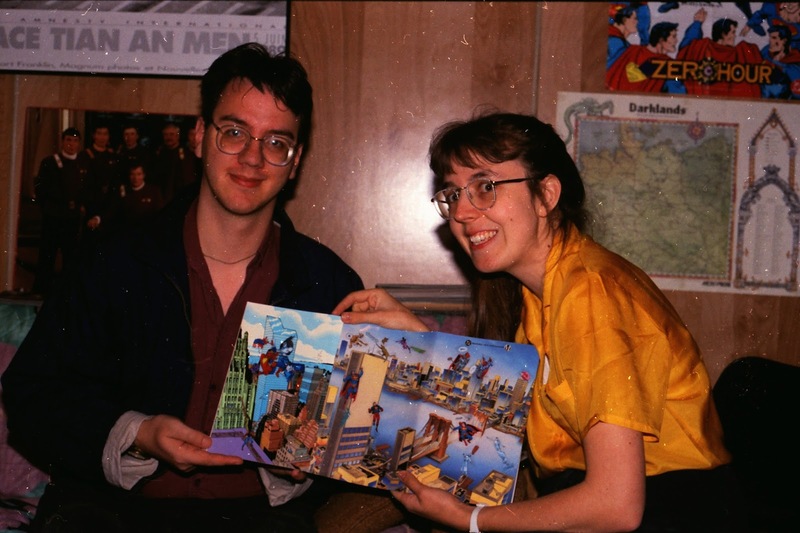 For whatever reason, Jeff and Susan posed with it on a visit to my basement lodgings in 1995. Yesterday's post included a Frisbee. I don't remember what happened to that glow-in-the-dark model, but the pink Wham-O that preceded it met a bitter fate sometime in the mid-1980s. My next-door-neighbour and friend Keith and I were winging the Frisbee back and forth across the front yard with all our strength, when suddenly Sean ran between us. I don't remember if it was Keith or me that flung the Frisbee at exactly the wrong moment, but the catastrophic result is forever seared on my mind: the flying disc was broken in twain by Sean's head. Sean himself fell crying to the ground. Fortunately Sean was more startled than hurt, but I still find it amazing that the impact was severe enough to shatter the disc. It wasn't quite broken in half, but it split in two all the way from one end to the other, the two halves held together by just an inch or so of plastic at the rim. 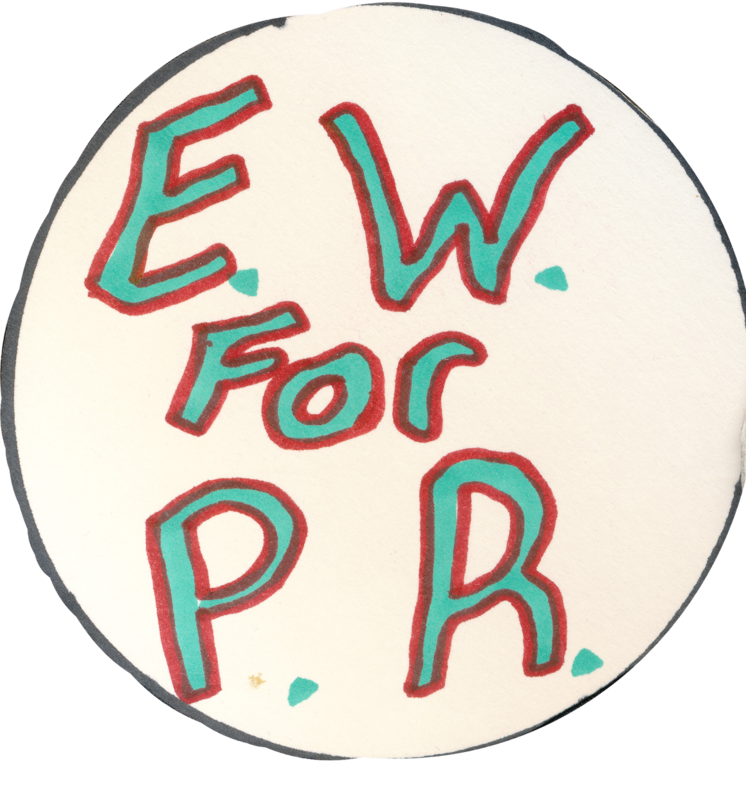 Sometime during the summer of 1987, I gave a thumbs-up to a glow-in-the-dark Frisbee and a bottle of Windex. And I shot of photo of this insignificant moment - on film, no less. Vernal Geekquinox 2016: Let the Games Begin! Pete's tradition of treating some lucky friends to a multi-course meal to celebrate the changing seasons continued yesterday with an eclectic menu of delights based on the long history of human amusements and games. The night began with one of Pete's best-loved creations, the hamachi shot, a blend of sushi, avocado, and...I'm not sure what else, but they were delicious. And I don't even like sushi. This is kofta, a blend of ground lamb and beef, served with pita bread and aliyyeh, a truly scrumptious sauce made with walnuts, coriander, jalapeno and other spices. The meat was excellent, but the sauce was so good that you could eat it straight out of the bowl - as a couple of guests did. When I left, I told Pete the kofta and aliyyeh was my favourite dish of the night, but on second thought I may have to give the edge to his Louisiana Cajun gumbo, a savoury blend of rice, sausage, chicken, shrimp and spices. Mike, who had recently travelled to New Orleans, declared it authentically Cajun. Pete's dinners stretch out over the course of long evenings, so this time around Ellen organized a game of Code Names to play while we waited for the main course, a hearty serving of roast beef, potatoes, carrots and sweet potatoes that I somehow failed to photograph...mainly because I was too busy stuffing my face, I suppose. To wrap up the evening, Pete served chocolate or vanilla cakes shaped like D20s to honour our many nights spent playing Dungeons & Dragons and other role-playing games. As you'd expect from a fine cake, these were moist, rich, sweet and delicious. Mike and Kelly (right) flew in from Vancouver Island to partake in the meal and the fellowship. Needless to say, it was great to have them join us! Just after midnight we posed for the obligatory "groupie," as Ellen calls the traditional group photo. I think it says "Ryan's girlfriend - became 1 week inclusive tomorrow." In the context of this book, I'm not sure what that could possibly mean. I don't know who shot this photo, when, or where, but I'm fascinated out of all proportion by the tower pictured here. It completely dominates the street. Is it a church? A grain elevator? A lighthouse? Oh, what a wonderful idea. Someone should build a fully functional lighthouse somewhere deep inland on the prairies. 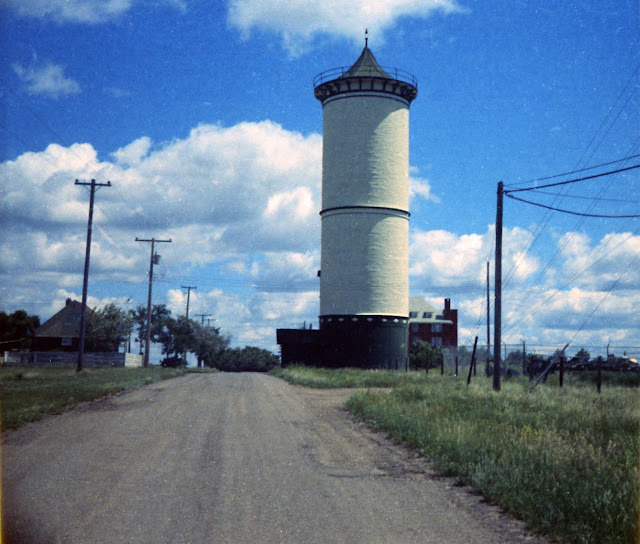 Giant Lighthouse on the Prairie! It would be accessible only by rail, and the protagonist would roll up to it on a handcart in the opening credits. Every week a new stranger would stop by and the lighthouse keeper (who is not the protagonist) would solve the stranger's problems. The protagonist, a teen, would complicate matters. "Ursula will kill her cousin." Well, we shall see. I found this in my copy of Kate Atkinson's Life After Life. That's what I get for buying used. 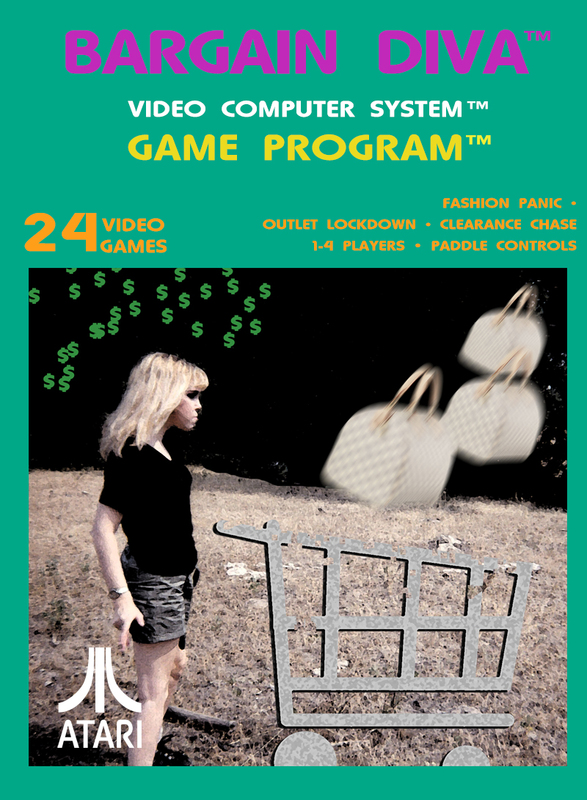 While I enjoyed playing games in the arcade or on the Atari 2600, it was the Atari 400 computer that really turned me into a lover of video games. Mom and Dad presented it to Sean and I for Christmas one year in the early 1980s, and I think he'd agree that it was one of the best presents ever. As one YouTube viewer noted, this Super 8 film couldn't have been shot in 1980, as I incorrectly state during the voiceover, as the E.T. doll featured at the end of the clip wouldn't have been released until 1982, or at the very earliest, the Christmas season of 1981, which I suppose is possible. In any event, along with the computer itself we received "The Programmer" package (the ATARI Basic cartridge and a couple of books, all of which were put to extensive use over the next five years or so), and two games: Pac-Man and Galaxian. Both games were very faithful recreations of their arcade counterparts, though the different proportions of arcade cabinet screens and 1:33 televisions made it necessary to squash the game dimensions a little. Even Mom and Dad enjoyed these games; they were colourful, fast-paced and easy to learn (though difficult to master). Not long after we picked up Star Raiders from a long-forgotten computer store on Argyll Road near Fort Ignition, Ltd., which Dad managed not far away from Argyll and 75th street. Star Raiders was one of the most advanced games of the era; you had front and rear views, a map screen, hyperspace, a targeting recticle, shields, a variety of enemies and a space station to replenish your supplies. ...Claim Jumper! With its jaunty musical score and head-to-head cowboy gunfightin', gold-stealin', tumbleweed dodgin', snake slitherin' action, Claim Jumper was a favourite in the Woods household. The object of the game was to gather gold nuggets, trade them in for cash, and deposit your cash in your bank. Of course the other player had the same object, and would try to shoot you to steal your gold or cash. We got pretty frenzied playing the game, and it was especially fun when my cousin Darwin came over; he really got into it, and expressed his frustration colourfully when Sean or I stole his gold. 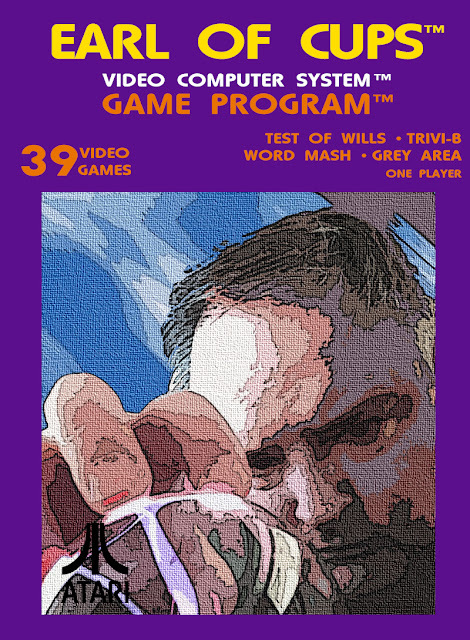 We played this game so often that the cartridge eventually wore out, much to our great disappointment. I've never been a sports fan, but I loved RealSports Tennis, a fluid, frantic representation of the real-world game that was at its best when played head-to-head. Sean and I spent many hours whacking the ball back and forth. The graphics look simple compared to today's games, but the gameplay was very solid; it really felt like you were in control of the ball. Pitfall II represents one of the great failures of my gaming life. Don't get me wrong; the game itself was fantastic, with cheery graphics, a jaunty score and challenging exploration puzzles. The failure was mine; despite hours and hours of attempts, I failed to complete the game. I know I came very close, because I'd completed two of three objectives multiple times; all that was left was the third objective, and when I came near these taunting words scrolled across the screen: "FINDING THE GOLDEN ROPE IS PITFALL HARRY'S ONLY HOPE." Well, I could see the rope, but I could never reach it thanks to the vultures or bats or whatever final beast stood in my way. You could play the game forever, no matter how many times you died, but after a few months of playing I gave up. In Miner 2049er you are Bounty Bob, and your mission is to paint the floors of a series of mineshafts with your feet while avoiding the mine's creepy denizens. If you entered the phone number of the software company on the Atari's keyboard, you could choose to start at any level. Don't ask me how we found that out before the Internet; that information wasn't included in the rule book. Our favourite level was the one with the dynamite, which you used to shoot Bounty Bob up to the top of the screen; throw in too much dynamite, and Bob would be spectacularly killed. Sean just reminded me that Pole Position was another of our favourite games back in the 80s. Based on the arcade hit from Namco, Pole Position puts you in the cockpit of a race car, which you...uh...race. Pole Position' graphics were a little blocky, but the sound was fantastic, and the gameplay was challenging without being overly frustrating. Crashing and running roughshod over the grass were all too easy to accomplish, but earning the titular pole position during the qualifying round was immensely satisfying. 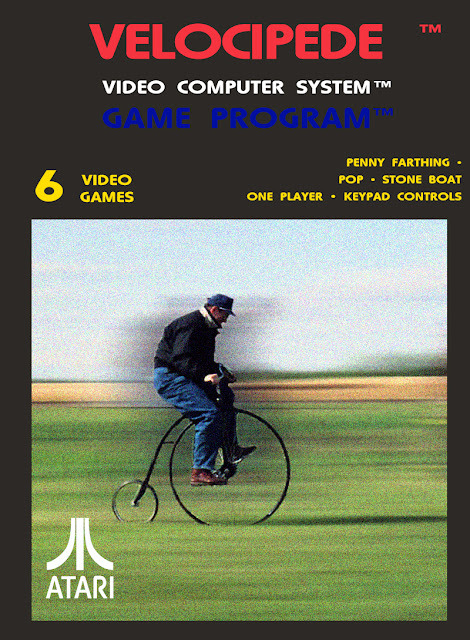 Our cousin Darwin had a more powerful Atari 800 at his home in Devon, and one of my favourite games to play at his place was Preppie! 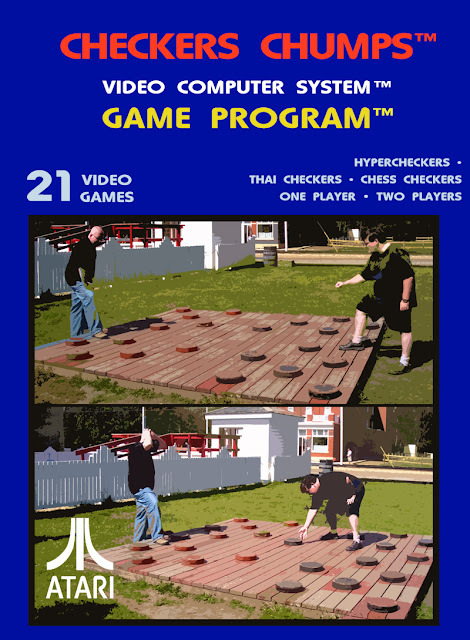 The gameplay is a lot like Frogger, with more whimsical art and sound; the object of the game was to collect golf balls while avoiding push mowers and riding on canoes and logs. I loved Preppie! so much that I bought the sequel, Preppie II, for our own computer at home. In Preppie II, the goal this time is to paint the floors of your prep school while avoiding giant frogs. The sequel has a new score, just as lovely as the old, and slightly improved graphics that equal charm of the first game. We were nine hours into the journey when the engines failed. Catastrophe was imminent; luckily, I had a window seat. The stars above were reflected in the dark, unforgiving Arctic Ocean. Based on our rate of descent, I anticipated burial at sea in about two minutes. And yet I was strangely calm; there was nothing I could do to alter my fate, so I may as well die with dignity. I twiddled my thumbs and watched as the ocean loomed closer with each passing second. But then the starlight reflected in the dark waters changed to the orange and yellow hues of civilization by night. There were cheers as the plane altered course to meet those lights, and the next thing I knew were were safe on the ground. At first I thought we must have landed somewhere on the north shore of Alaska, but when we debarked I discovered that we were in fact the guests of Skulkovia, a small, densely populated island midway between Alaska and Siberia, in the Bering Strait. It was, of course, the most technologically advanced civilization on Earth, with a mixture of Russian and American culture reflected in the island's architecture, clothing, music and technology. All of us passengers were warmly greeted by a small army of Skulkovians dressed in ornate uniforms of red and gold. We were welcomed into the airport mall and encouraged to use the communications kiosks to reach our loved ones. It was a world of gleaming chrome, glowing neon and shimmering vector graphics dancing across flexible datascreens that flowed along the walls. Naturally I deployed my trusty SLR; it was a new model, but the technology was bulky and primitive compared to what the Skulkovians used. I was a little embarrassed to be photographing Skulkovian wonders with my third-class gear, but I wasn't going to miss capturing at least a couple of memories. To my surprise, I caught sight of my old colleague Avril, who I hadn't realized was on my flight; she was hefting an old camcorder on her shoulder, which made me feel a little better about my camera. I was feeling pretty good about the whole affair until I saw a lineup of weary men and women trudging toward the opening to a dark corridor. There was no animation in their faces, and each wore a baggy, worn, grey coverall. I started to raise my camera in their direction, but then I turned away with a mental shrug and focused once again on the perfection of the mall and its beautiful citizens. As a special guest, I didn't want to embarrass my generous hosts. Hadn't they saved us all? Earlier today I noticed an orange sticker on the ceiling above my cubicle. "What's this orange sticker?" I asked, pointing to it even though no one was watching or listening. If I squinted, I thought I could make out the old Edmonton Telephones logo. I stood in the doorway of my cubicle for a better look. At that moment, one of my colleagues passed by. "Property of Edmonton Telephones," she answered. Vindication! Then I noticed that my co-worker seemed to be heading home a little early. "Are you leaving us?" I asked. "Doctor's appointment," she said. "I've been waiting two months to see this person." "Have fun," I said, returning to my cubicle. Then, after she left, I reconsidered my statement. "I suppose you're not likely to have fun at the doctor," I said, beginning to chuckle, "Unless she's a Doctor of Clown Studies!" I barely managed to squeak out the punchline over my hysterical laughter, though my remaining co-workers did not seem amused. Despite earning just 4 out of 20 points in the opening Sports & Leisure round, Maegan, Kristen, Arlene and I did well enough in successive rounds to score a cumulative 60 out of 100 points, good enough for 17th place out of 80 teams. The compilation above is just one of many fascinating glimpses popular culture edited together by YouTuber RwDt09. As a fan of the art of television programming, I appreciate RwDt09's dedication to preserving television history, right down to obscure oddities that lasted a half-season or less. If you're a fan of television, nostalgia, or just the beauty of a good opening credit sequence, I urge you to visit the channel - there's lots of good stuff here. This Atari cartridge is inspired by the time Sylvia asked me to stop at Winners for "a few minutes." Four hours later, Sylvia had a shopping cart full of fine clothes purchased at a steal. 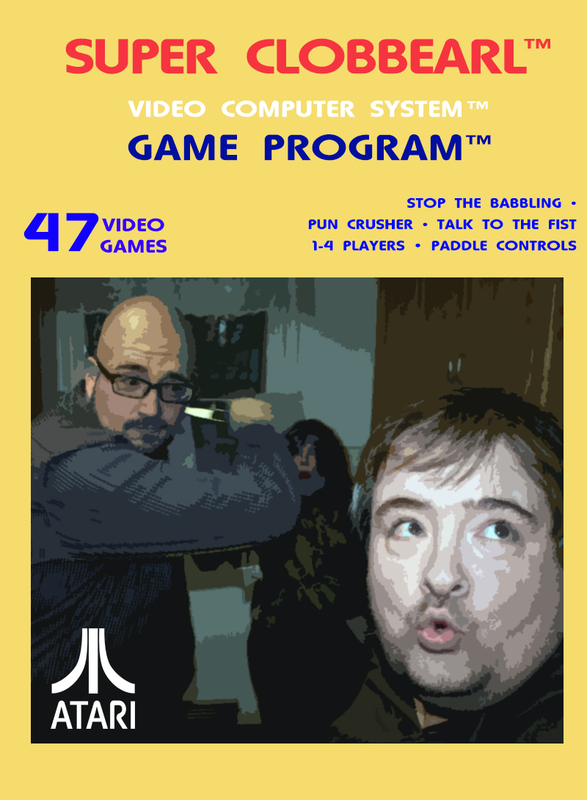 Another lost cartridge for the Atari 2600. A couple of weeks ago I wrote about some of my favourite arcade games. Tonight I consider some of my favourite games from the so-called second generation of video games, chiefly those found on the Atari 2600, the Intellivision and my cousin Darwin's Arcadia 2001 - marketed in Canada as Leisure-Vision. We didn't have an 8-bit machine in our household - my parents wisely purchased an Atari 400 computer instead - so my experiences with the world of 8-bit games was confined to the times I played at the houses of friends. I don't remember which friend introduced me to Adventure, but I loved it; as a fan of swords and sorcery, I found the notion of slaying dragons and finding the golden chalice pretty enthralling, even if the game is really primitive by today's standards. On the other hand, I remember playing Outlaws at Paul Ravensdale's place quite vividly; shooting each other through an endless parade of covered wagons was a scream. The frenetic action probably came close to spraining a couple of wrists. Atari's adaptation of the complex arcade smash, Defender, couldn't emulate the superb graphics and sound of the arcade machine. But the gameplay was pretty good, especially considering they managed to mash all those controls into the Atari joystick. On one memorable afternoon, I managed to roll the score counter, albeit on the easiest setting; it remains the pinnacle of my video game achievements. As much as I loved high fantasy, I was also a huge fan of jungle adventures thanks to Tarzan and Allan Quatermain. Playing Pitfall was like jumping into one of their tales; it had rolling logs, dangerous snakes, crocodiles and scorpions, underground tunnels, and even swinging on vines over obstacles, complete with a Tarzan yell. I never found all the gold bars, but the joy was in the journey. When the Intellivoice module was released for Intellivision, a lot of gamers went a little nuts over the revolutionary notion of games that talked. B-17 Bomber was not only a fun World War II flying game, the voices blurted out hilarious warnings such as "Bandits - 6 o'clock!" Astrosmash for the Intellivision was a faster-paced, more colourful version of Space Invaders. Gameplay may have been simple, but blasting space sponges (at least, that's what they looked like to me) was a fun way to spend a Saturday afternoon. 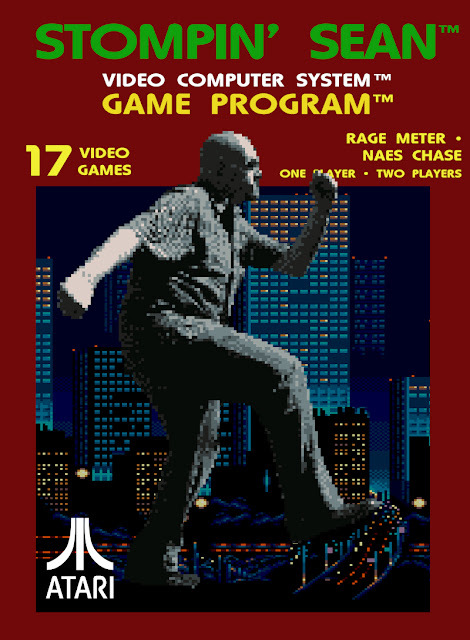 Yar's Revenge was among the very best of Atari's 2600 releases. It was pretty high concept; you played the role of an intelligent being evolved from Earth houseflies, defending your planet from a Death Star-like doomsday cannon protected by a thick layer of shielding. There was also a neutral zone to protect you. You had three weapons: your mandibles, which you could use to eat through the shield, a ray gun, which you could use to shoot the shield, and your own mega cannon, which you had to use to blow up the bad guy's doomsday weapon. What made it especially challenging was the requirement that you had to get out of the way of your own shots when firing your main weapon. 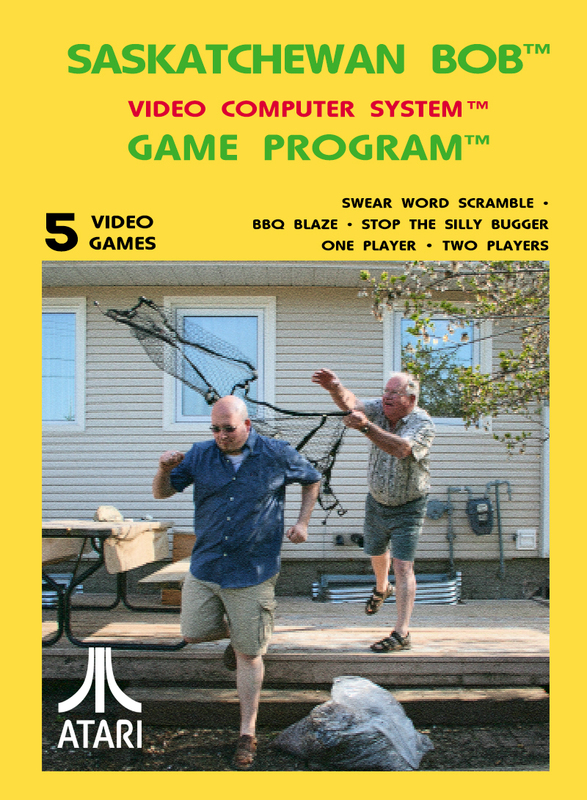 At the time many reviewers panned Combat, the game that came packaged with Atari 2600 systems. Sure, the graphics aren't pretty, but the player vs. player action could get pretty intense, whether you were driving tanks or flying jets or biplanes. I can't be sure that Darwin had an Arcadia 2001/Leisure-Vision, but the controls and design of the system evoke strong memories. I recall a racing game that put the two of us on the mean streets of a blocky 8-bit suburban neighbourhood, zooming back and forth, heedless of the hazard we presented. But if you ran your car into the exhaust creature that snaked along the roads, you were doomed. The Arcadia also had a pretty good baseball simulator for its time, which also provided some entertainment. Earlier today my brother sent me a text related to video games. Inspired by the combination of Sean and Atari, I made this just now.